Early game is spent setting up. 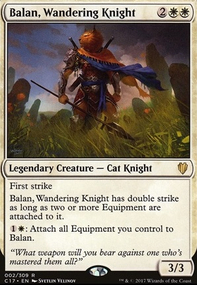 Any ramp, utility creatures, and Equipment are played in the first several turns to prepare the board for Balan, Wandering Knight . Once the board is ready, Balan is cast, equipped, and starts the clock. Further resources are devoted into keeping Balan suited up to retain her quick clock, casting new Equipment or recurring destroyed ones when necessary. I'm also disrupting my opponents' game plans with removal and may pressure other opponents with any available alternative threats. In the event that Balan dies, she is recast and reequipped through her ability to quickly resume her assault. If I'm in a situation where recasting Balan isn't ideal, such as right after a full board sweeper, the deck's alternative threats pick up the slack until the board is restored for Balan to take command again. If Balan ever becomes too expensive to recast and Command Beacon isn't available, my deck's alternative threats fully take over and I attempt to defeat my opponents though regular Equipment beatdown. This is my first Commander deck. I started building in October 2011, with Kemba, Kha Regent as the first Commander for her synergy with Equipment. The earlest builds of this deck were a Token/Voltron hybrids to benefit from Kemba's cats. Overtime the token support dwindled, as I no longer cared about the token aspects of the deck and desired to focus more into accomplishing Commander Damage kills. In July 2013, Eight-and-a-Half-Tails , took over from Kemba as the second Commander shortly after the token support was dropped completely. 8.5 was much better suited for a Voltron strategy by using his protection to keep targeted removal off of himself and my Equipment and bypass blockers. 8.5 wasn't without his own issues. 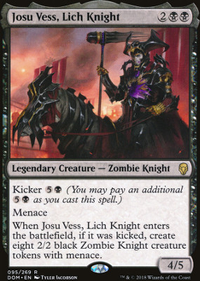 He's essentially useless early game and the occasional games with mana screw botched his effectiveness, but he was the best Commander available that fit my needs. Aether Revolt gave this deck its third Commander, Sram, Senior Edificer , and Equipment synergy returned to the Command Zone. Sram's ability to drop as early as Turn 2 and begin the Commander Damage death clock much faster than his predecessors while keeping my hand stocked fit the deck very well. Sram's reign was short-lived. Commander 2017 heralded this deck's forth and current Commander, Balan, Wandering Knight , who possesses what her predecessors never had: raw power. Balan is an Equipment master, able to quickly defeat opponents with the minimal set-ups. Shuffles away a stagnant hand for fresh cards. Treasure synergy, providing ramp and card draw. A full board clear with cycling. Allows Balan or a key utility creature to be flashed in and catch opponents off-guard. Can also be "cycled" if necessary. A sweeper that benefits Voltron. A Planeswalker that provides an indestructible body, keywords, and removal. Commander decks are dynamic and ever-changing. New cards replace the old, players adapt to each other's strategies, and opinions of cards can alter over time. What was yesterday's strong additions can become tomorrow's weakest links. No deck stays the same for too long. The following cards are what I'm currently thinking about dropping, either because, they're no longer effective, I became uninterested in them, or they're being replaced with something better. The following are changes I'm currently testing. Not every card is going to be usable. Some have become obsolete, some are overall too weak, and some just don't fit the theme properly. Whatever the reason, there are some cards that I simply don't want in my deck. I have no intention of using any of the following cards. Darksteel Plate has been outclassed by Hammer of Nazahn, and there's no space for both. Fireshrieker is a dead card for Balan. Grafted Exoskeleton would devolve the deck into getting poison kills. Absolutely nobody enjoys fighting against poison. Masterwork of Ingenuity doesn't function well when the vast majority of your Equipment aren't worth copying. The Kaldra Set has been antiquated by newer Equipment and getting the whole set out at once is too inconsistent and inefficient. Lightning Greaves & Whispersilk Cloak offering shroud is a problem in a deck that has to target its own creatures. Sure, Balan can bypass this issue, but the deck's back-up threats can't. Skullclamp can't draw many cards in a deck with limited access to expendable X/1s. Swords of Body and Mind & War and Peace are the weakest of the Mirran Sword cycle, with triggered abilities that don't benefit a Voltron strategy. Relic Seeker tutoring post-combat is a bit awkward. Steelshaper Apprentice is a bit slow. Taj-Nar Swordsmith needs way too much mana at once to grab anything powerful. Quest for the Holy Relic has a clunky hoop to jump through and is a horrid mid-late game draw. Auriok Steelshaper shaving off only a single mana from equip costs isn't enough. Indomitable Archangel & Fountain Watch offering shroud is awkward with this deck's artifact creatures. Archangel's metalcraft is also a significant speedbump. Kemba, Kha Regent and her Cat tokens conflicts with the deck's pure Voltron strategy. 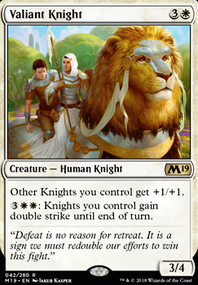 Leonin Shikari granting Equipment the ability to equip at instant-speed doesn't do a lot for a Commander with an attach ability. Stone Haven Outfitter is pretty mediocre in a Voltron strategy, and Balan's death will never trigger its card draw ability. All Is Dust was in the deck before, but had to be replaced to solve the deck's lack of harder artifact hate. Banishing Light & Oblivion Ring are both outclassed by stronger variants. Council's Judgment gives opponents too much sway over what gets exiled. Dispatch compares poorly to the superior Path to Exile and Swords to Plowshares. Mass Calcify costs too much for a creature-only sweeper and will backfire against White opponents. Fetchlands are primarily for colour-fixing, which a mono-coloured deck doesn't need. Deckthinning is statistically negligible, especially in Commander with 99-card decks. Artifact Lands don't provide any meaningful utility and will end up as collateral damage from sweepers more often than not. Cavern of Souls doesn't do much in a non-Tribal, mono-coloured deck. Just using it to make Balan uncounterable feels like a waste. Eiganjo Castle has a very low-impact ability that's easily outpaced by the deck's Equipment. Flagstones of Trokair doesn't do anything relevant for this deck. Inkmoth Nexus, like Grafted Exoskeleton, promotes a horrid win-con that is hated by everyone. New Benalia & Zhalfirin Void don't do enough. The Cycling Lands are much better. Nykthos, Shrine to Nyx can't function properly in a deck with a high concentration of colourless permanents. Temple of the False God is a trap that promises to produce two mana, but is a dead card when that two mana matters the most. Avacyn, Angel of Hope & Darksteel Forge have cumbersome mana costs and can't effectively protect my Equipment in the wake of the quality, efficient exiling removal that's being printed nowadays. Bastion Protector only boosting Balan is too narrow. It having 3 toughness is also a factor. Iona, Shield of Emeria is a mean-spirited griefer card that unnecessarily hates on mono-colored decks. Her entire purpose is to stop players from playing the game. Why is she even allowed in this format? Ranger of Eos doesn't work well with the small number of 1cmc creatures this deck has. Adding more creatures would be forcing Ranger to work instead of it being a natural addition. If more worthy 1cmc creatures get into the deck on their own, Ranger may be reconsidered. Inspiring Statuary can't make artifacts (and by extension Equipment) cheaper, which is the card type that matters the most in this deck. Land Tax was in this deck since the beginning until I replaced it with a card that isn't tied to an upkeep trigger and has better synergy with the deck. Since Balan focuses solely on Equipment, Auras have no place within this deck. Vehicles have been deemed too much of a distraction. Balan will almost never have the time to crew them, and the higher crew costs are too difficult to achieve for this deck's low-power utility dorks. Equipment decks will naturally incentivize heavier use of artifact hate, and non-Equipment artifacts will frequently end up as collateral damage. I'm intentionally keeping mana rocks to an absolute minimum and abstaining from mana doublers entirely, focusing mostly on land-based ramp options instead. Extraplanar Lens doesn't like a mana base with a high nonbasic land count. Gauntlet of Power can increase White opponents' mana production. Caged Sun has a higher mana cost that can burn up a turn without accomplishing anything. The longer the game goes, the less effective they can become. Not enough of them isn't consistent in a 99-card deck. Too many of them eats up space on non-synergistic cards. All decks aren't going to be vulnerable to them equally. Not drawing them feels no different that not using them. Overall, it's not worth the loss of deck synergy for the random chance of stopping opponents tutoring, ramping, or abusing ETB triggers early enough in the game to matter. If I'm going to use a Hate Card, it has to be effective against the majority of strategies and completely functional at any stage of the game. I don't like MLD in Commander. It's either win-more when I'm ahead or kingmaking when I'm behind. There's no middle ground. MLD also carry the stigma of ruining games. Not what I want for this deck. Mono-White has been getting rather spoiled in this trip to Ravnica. First there was Dawn of Hope from Guilds of Ravnica offering card draw with the rather minuscule hoop of lifegain to jump through. And now Ravinca Allegiance has given us mana ramp. Smothering Tithe is a unique ramp effect. It creates Treasure tokens instead of putting additional lands into play or directly producing mana. This allows the mana gained from it to be stockpiled until it's needed. Smothering Tithe also punishes large-scale card draw effects, giving me a tremendous boost of mana. Being an enchantment is another bonus, as it's less likely to be destroyed by my opponents' removal than a traditional mana rock would. There is a question that pops up when discussing Smothering Tithe: "What if opponents pay the to deny the Treasure token? It won't ramp then!" If that happens, then the opponent has spent two mana for nothing, leaving them less available to work with for their turn and to keep open for instant-speed interaction during mine. But honestly, who is going to pay the tax? This isn't Rhystic Study. I'm getting Treasures, not drawing cards. I took out Wayfarer's Bauble for Smothering Tithe. While I prefer to have this deck's ramp effects to be land-based and enable an early Balan , Smothering Tithe's mana production benefits late-game rebuilds and most ramp effects tend to lose their luster as the game goes on. With Smothering Tithe inevitably creating spare Treasures, I would like to have some uses for them beyond mana. Treasure Map Flip has been added to the Maybeboad as potential Treasure synergy. Enchantments were never a major aspect of this deck. It was just Land Tax and various generic hate-cards for the longest time. Not really worth recurring, but if I did need to do so, Sun Titan was available to do so. When Sram, Senior Edificer became this deck's Commander two years ago, I planned for future Aura support. This plan never came to fruition after Balan took over as Commander mere months later, and the idea of using additional enchantment recursion were entirely scrapped. However, enchantments are no longer mere land drop enablers and hate-effects. They're now removing multiple permanents at once and giving Equipment flash and attaching them for free. Hot, new utility enchantments have also bestowed Mono-White with card draw and mana ramp it normally doesn't get. With a solid number of powerful, high-quality enchantments in the deck, just using Ol' Sun Titan isn't enough. Restoration Specialist has been incorporated into the deck, giving it a second source of enchantment recursion. When Armory Automaton was added to the deck back in late 2016, Eight-and-a-Half-Tails was the Commander. Old 8.5 always had early-game troubles, having to wait until I had sufficient mana available to hold his abilities up while also equipping him. This deck needed early-game pressure, and Armory Automaton filled that need. Unlike 8.5, Balan is early-game pressure. And for slower openers that do need some other form of early presence before she can jump in, this deck has plenty to work with. Even then, it doesn't take much for her to be an active threat. Armory Automaton has lost its niche, and was dropped to make room for card:Resoration Specialist|Restoration Specialist. I've been really indecisive on what grave-hate card to use in this deck. The one grave-hate slot has been swapped a few times for the past while and I haven't been satisfied. A since card hasn't been able to offer everything I require for sufficient grave-hate. This deck now sports two cards to pick up the slack, each focusing on different roles while also possessing a secondary use aside from grave-hate. Scavenger Grounds is the grave-hate card that fills the "full purge" role. When the graveyards are getting too full and/or there's a dedicated Graveyard deck at the table, this is the card that takes them down a peg. Scavenger Grounds is also capable of a second purge by sacrificing Desert of the True instead of itself. Tutorable with Expedition Map and Weathered Wayfarer. Outside of grave-hate, it's still a land. Petrified Field was cut for Scavenger Grounds. I won't have to worry about recurring lands if they're all getting purged, and there's still Sun Titan available to bring them back. Stonecloaker is the grave-hate card that fills the "single target" role. Cherry-picks the graves to stop targeted recursion or to preemptively remove problematic cards. Tutorable with Recruiter of the Guard. Outside of grave-hate, it can save another creature from death, get a second use out of an ETB trigger, and is a body to wield a Sword when necessary. Cloaker has replaced Remorseful Cleric as the Recruiter tutor target. Scavenger Grounds now provides the full grave purge and Cloaker has more utility. Masterwork of Ingenuity was an exciting card when it came out in Commander 2014. Cloning Argentum Armor has been great fun for the past four years. Although, Argentum Armor is pretty much the only Equipment I've been willing to clone. A second copy of Inquisitor's Flail works and another Batterskull is useful in a pinch, but everything else doesn't fare well. They either have keywords and static abilities that don't stack, have P/T boosts too small to bother, or are Legendary. In fact, Legendary Equipment is a significant problem for Masterwork. One of the reasons I took out The Kaldra Set back in 2015 was to increase the number of potential clone choices. This has ultimately failed with the release of card:Legendary|Hammer of Nazahn Equipment that have, in my eyes, become indispensable staples of the Voltron archetype. Another factor that botches Masterwork's performance is Balan herself. I can't use it to copy a Swiftfoot Boots or a Sword to protect a utility creature when Balan's attach ability affects every Equipment I control. I'm taking this opportunity to use this Equipment slot for Basilisk Collar. Its deathtouch allows Balan to defeat any creature in combat, can be paired with one of the Equipment that offer trample to minimize blocked damage, can be thrown on any chump blocker to deter non-evasive threats, and is another source of lifegain for Dawn of Hope. Why am I mentioning this? Because the same is said for Noble Templar. Last year, I replaced Land Tax with Tithe to acquire Plains before an upkeep trigger and to have another tutor for Mistveil Plains . Tithe , unfortunately, has the similar late-game problem as Land Tax: if have plenty of basics and already have Mistveil Plains, then it's not capable of whole lot anymore. With Templar, just like the Dragon, I always have the body to fall back on. A body fully capable of wielding a Sword.